reduction in mining fugitive emissions. building resilience in ecosystem processes. Australia is one of the most dry, sunny, windy places in the world, and is surrounded by oceans. This gives us, our region in particular, unlimited opportunities for renewable energy initiatives. The supply of electricity and fuel is an important resource issue for our region, not only because 37 per cent of our greenhouse gas emissions are attributed to electricity production and use, and 27.8 per cent to fuel; but also because we currently export coal resources and have the potential for much larger coal and gas exports over the next 50 years. This is an area where efficiencies in our region’s carbon exchange could be made. The majority of current domestic supplies for electricity and fuel in our region are via finite fossil resources including thermal coal, gas and petroleum. However, technological innovation is providing more efficient ways to use electricity, as well as clean renewable energy and fuel sources. Opportunities to produce renewable energy are being actively investigated in our region, including solar panels and solar thermal, hydro-electric, biofuels, wind and wastes. In particular, the advent of micro, medium and large-scale solar energy technologies and of high-performance low-cost batteries could be considered global energy game changers. Our region is known for its many days of sunshine per year. As an example Townsville is celebrated for having around 300 days of sunshine per year and was a location for the Australian Solar Cities programme (Townsville City Council, 2015). Renewable solar power has been identified as an opportunity for our region with proposals at Clare, Collinsville, The Pinnacles and Charters Towers having the potential to power tens of thousands of homes. There are also aspirations for biofuel production and co-generation power sourced from sugarcane and sorghum in the Lower Burdekin and Pentland (Austcane Energy Ltd , 2015) (Renewable Development Australian, 2015). The Queensland Government is actively promoting biofuels and bio-manufacturing industries in Queensland to reduce greenhouse gas emissions and contribute to regional growth. (Department of Energy and Water Supply, 2015). Methodologies for developing carbon sequestration projects must be approved via the Emissions Reduction Fund and involve stringent requirements. One of the obligations to qualify is to hold the carbon produced by sequestration projects for 25 or 100 years. For example the life expectancy of native or forestry trees must meet this time frame. Orchard trees are not covered by the current methodologies for carbon sequestration due to factors such as short life cycle and controlled pruning. To support landholders and to promote carbon reduction in the region, NQ Dry Tropics has developed an indicative strategic carbon planting tool to assist with identifying areas for possible tree plantings for carbon capture. These include potential areas where planting native species would improve biodiversity and habitat connectivity, as well as other locations where mono-species could be planted (see Figure 6). 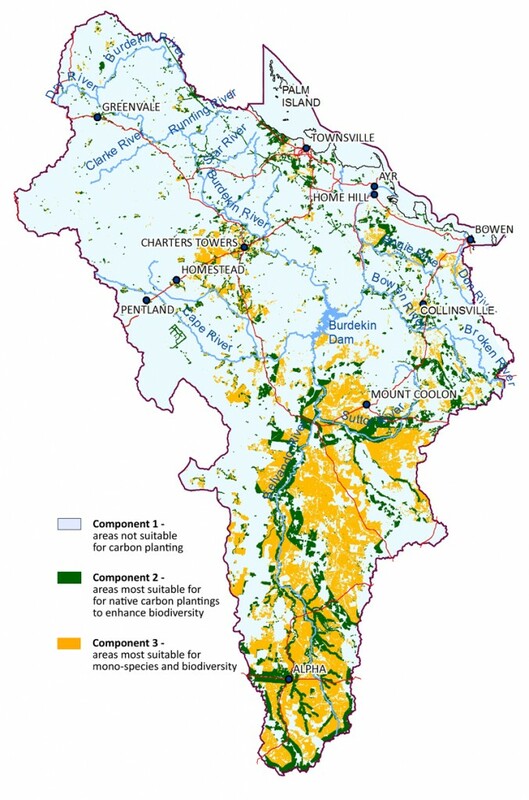 Planting native species in identified biodiversity areas would generate multiple benefits, such as: reducing carbon emissions; earning income from carbon storage; creating native habitat; and increasing wetland buffers and riparian corridors, which also increase filtration of water runoff and overall landscape resilience. The Queensland Government has developed the interactive Regrowth Benefits Tool, which provides site-specific regrowth information on carbon abatement potential, threatened species, biodiversity benefits and key Queensland Government regulations (Queensland Department of Environment and Heritage Protection, 2016). There is currently an approved government method allowing people to bid for financial support to change savanna burning practices on areas with more than 1,000mm average annual rainfall, and a new method is being approved for burning practices in areas of savanna vegetation with average annual rainfall between 600 and 1,000mm (see Figure 7) (Australian Government, 2016). The figure depicts areas in the catchment where each of these methods apply and where landholders can use the government’s Direct Action Plan to enter into a financial contract to increase soil carbon storage. 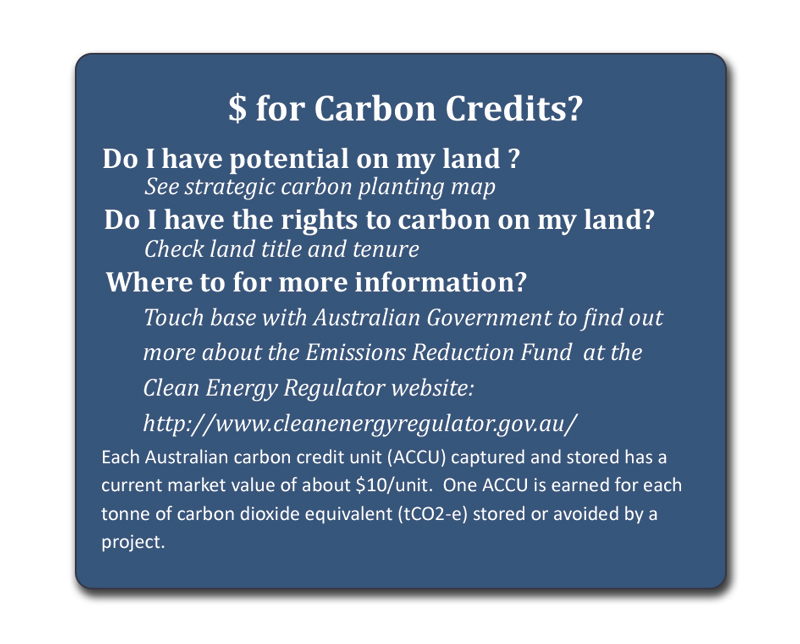 When considering implementing a carbon sequestration project, such as planting trees or soil carbon sequestration, it is prudent for landholders to weigh up all the attributes and values of the land being used including its current and future use and productivity. To ensure our future food sources and livelihoods, it is vital that our natural resources and communities are resilient to the predicted pressures of climate change. It has been recognised that a concerted shift towards best-practice natural resource management and planning will increase the economic sustainability of agricultural and ancillary industries and make our natural resources more sustainable and resilient (United Nations, 2013). Land ecosystems have been able to absorb a third of the human-induced carbon emissions since the 1960s (Lund University, 2015). Semi-arid ecosystems, such as the savannas that dominate our region, are extremely important in controlling carbon storage. Compared to rainforests, savannas are able to grow more biomass to store carbon taken from the atmosphere. This highlights the importance of protecting our savannas and other dry ecosystems for mitigating climate change. Coastal and marine ecosystems also have important carbon capture capacity. A new study has identified that the carbon capture and storage capacity of wetland vegetation (known as blue carbon) make our coastal habitats some of the most carbon-rich ecosystems on the planet (Kelleway, 2015). The study found that seagrass, mangroves and salt marsh habitats are more efficient at capturing carbon than rainforests. A recent study between the Australian Government, James Cook University and CSIRO developed methods to identify natural areas that are resilient to changes in climate. Climate-resistant areas were shown to be in locations that included valleys or elevated areas where animals could survive projected warming. Using methods such as this provides strategic direction and gives guidance about where conservation efforts can be focused, for example where nature refuges should be established (Reside, et al., 2013). Making appropriate land-use planning decisions, such as incorporating coastal management planning and coastal adaptation strategies at a landscape level, is vital to ensure the community can deal with impacts from climate change. Community resilience also includes people becoming more adaptive to changes in their surroundings. This can be achieved by having prior knowledge about climate change and adequate time to be able to make planning and management changes (Marshall, 2013). 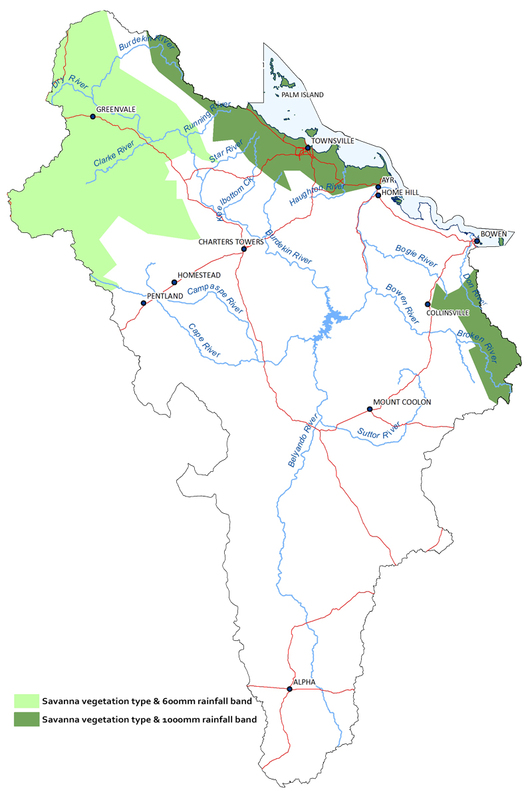 Land and water management techniques to improve the sustainability and resilience of natural resources are detailed in other parts of the plan. Using natural resources sustainably includes limiting how much we use and how much we reserve to respond to climate change. Goals and objectives highlighted in the plan include using water efficiently, maintaining soil health, providing nature refuges, and maintaining habitat corridor widths. The way we plan, manage, make decisions and allocate our natural resources will need to be based on a better understanding of how natural resource conditions and distribution will change and account for predicted climate change impacts, such as longer dry periods.